I’ve looked at a few different Mido watches over the last couple of years, and while they have been a variety of types and styles, it’s safe to say that none of them were purpose-built dive watches. That’s not something that the brand has really focused on or put to the forefront. 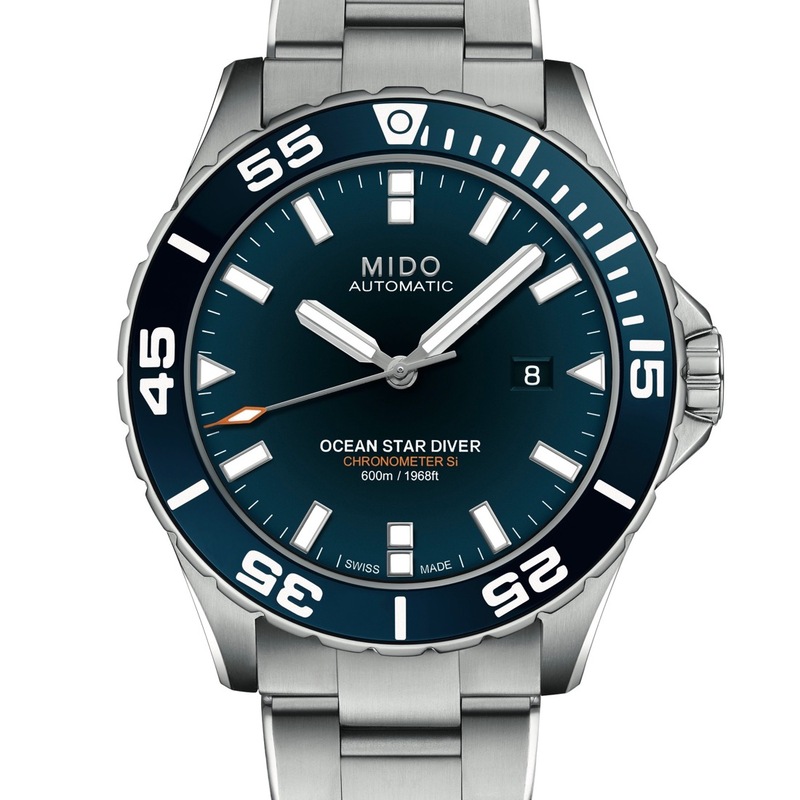 Well, that changes with today’s release of the Mido Ocean Star Diver 600. The brand has gone super-serious with the Mido Ocean Star Diver 600, and that’s evidenced by the WR rating that the watch is tested to – 600m. Now, of course, you and I will never dive to those depths (unless you happen to be a saturation diver) but it does show a serious commitment to building a watch (and case, specifically) that is ready to protect it’s inner workings, and keep you safe and timed as well. Tucked inside the super-robust 43.5mm case, and protected with the helium escape valve, is the Mido Caliber 80 movement, which is based off of the ETA C07.821. This is a COSC-certified movement with a silicone balance spring, so it will be kept pretty accurate, no matter what you find yourself in the middle of. The case itself looks the part of a diver, and the matte finish on the lumed ceramic bezel insert is right on for the design as well. In short, the overall design, and the dial specifically, of the Mido Ocean Star Diver 600 have all the hallmarks of a classic dive watch look, albeit with a handset that is very Mido. This is what I like to see out of a dive watch, and it’s why this sort of design can be so universal, and apply across a wide variety of situations (great for us desk diver types, no?) There’s no hard specs on the height of the watch, but with the 600m rating, you can be certain this is not a dainty watch. Automatic Mido Caliber 80 Si (ETA C07.821 base), COSC-certified chronometer, 111⁄2’’’, Ø25.60 mm, height: 5.22 mm, 25 jewels, 21,600 vph, ELINFLEX mainspring, silicone balance-spring, decorative disc with transferred Si logo on the balance bridge. Finely decorated chronometer movement with blued screws, oscillating weight decorated with Geneva stripes and Mido logo. Functions: HMSD. Adjusted on 5 different positions for high accuracy. Satin-finished and polished 316L stainless steel, polished and satin-finished bezel with ceramic ring featuring engraved numerals filled with Super-Luminova Grade X® and a unidirectional blocking function. Ø43.5 mm, 2 pieces, sapphire crystal with anti-reflective treatment on both sides, screwed crown and case back. Starfish engraved and polished on the case back, helium valve, finely decorated Si chronometer movement, water-resistant up to a pressure of 60 bar (600 m/1968 ft). Bracelet: Satin-finished and polished 316L stainless steel integrated into the case, folding clasp. Dial: Lacquered blue, polished applied indexes with white Super-Luminova ®, date at 3 o’clock. Hands: Diamond-cut and satin-finished, skeletonised and filled with white Super-Luminova Grade X® for easy readability at night.